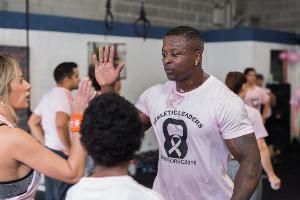 MISSISSAUGA, Ontario - Oct. 9, 2018 - PRLog -- Calling all breast cancer survivors, fitness enthusiasts, athletes, celebrities, political leaders and the community! Please join Mississauga's prominent athletic training facility, Athletic Leaders (3240 Semenyk Ct. Mississauga, ON) on Saturday, October 20, 2018 from 10:00 am to 12:00 pm as they will be holding their 3rd Annual Kettlebell Swings For Breast Cancer Challenge Fundraising event. The challenge is on to do 1000 swings in one hour per person, with each swing raising money for the Canadian Cancer Society. This event is free to attend but donations will be accepted at the door. The fitness centre will also have other surprises for participants, so make sure you all come out to support a great cause. At the 1st annual challenge in 2013 and the 2nd annual challenge in 2016, a combined total of 60,000+ swings were completed which helped to raise over $5000.00+ for the Canadian Breast Cancer Foundation (CBCF). The donations were used for cause-related work, including breast cancer research grants, fellowships and community health grants. This year Athletic Leaders is excited to partner with the Canadian Cancer Society to complete more swings and raise even more money to help fight cancer. "We are gearing up to break the current swing record for our 3rd annual edition of Kettlebell Swings For Breast Cancer in support of the Canadian Cancer Society. We believe this event not only helps to support a good cause but also effectively encourages the community, by using physical activity as a tool to embrace a healthy lifestyle. "- says Granville Mayers, Owner of Athletic Leaders. At 44 years old Coach Granville Mayers defies odds as being one of the strongest powerlifters over the age of 40 in Canada. From December 2016 to present, Mayers has competed in a number of meets to officially hold the current Canadian Powerlifting Federation national records in a number of fitness categories. He is currently also the 2018 Amateur World Powerlifting Congress Record Holder. "In less than 2 months I have set 9 world records and I am honoured to be the 2018 AWPC Masters World Champion. At 44, I am one of the strongest men in Canada and drug free! This is why it is important that I continue to live a healthy and active lifestyle to keep in shape, become stronger and break more records. Our fitness programs at Athletic Leaders prove that at any age you can be fit, strong and reach your fullest potential. At our fundraising event you will have the opportunity to meet with me and my team, learn how you can start your own fitness journey and help fight cancer. "- says Granville Mayers, Owner of Athletic Leaders. To donate directly to the Canadian Cancer Society for this challenge please visit Athletic Leaders Fitness Instagram page (@coachgranville) and click the link in their bio. Athletic Leaders provides the highest quality sports-specific, personal training and boot-camp classes with guaranteed results by certified trainers with knowledge & experience. Professionals committed to meeting the growing needs of the sports training industry, we are athletic leaders with a mission to educate and help each individual reach his/her fullest potential through safe and core training, stability, strength training, metabolic work, and nutrition. After just one week of Athletic Leaders Body-Blast Boot Camp, you will feel leaner, younger, and stronger than ever before! Whether your goal is losing weight, gaining strength, improving your athletic ability, or being in the best shape ever of your life, our high intensity, muscle confusion workout is the BEST program for you! Visit us at: www.athleticleaders.com. The Canadian Cancer Society is a national community-based organization whose mission is the eradication of cancer and the enhancement of the quality of life of people living with cancer. When you want to know more about cancer, visit our website www.cancer.ca or call our toll-free, bilingual Cancer Information Service at 1-888-939-3333. If That New Year’s Weight Loss Resolution Is Already A Distant Memory…Here’s Help!